"Death Means Never Having to Say You're Sorry"
Our tale begins inside the Fortress of Solitude where Superman makes a routine call to Van-Zee in the bottle city of Kandor. Superman apologizes for interrupting Van's meditation and this leads to a heated discussion between the two about the fact that Superman needs to get some sleep. It had been a busy week for Superman between a battle with Bizarro and a break-out of the Mount Olympus maximum security prison. Superman managed to round up all of the escapees with the exception of the break-out's mastermind the Master Jailer. Van informs his friend that even Superman needs REM sleep and that maybe he should send Supergirl to the Crystal Hill Game Preserve dedication in his place so he can get some rest. Superman snaps at Van and says he will see him on Friday before flying off. Supergirl and Van discuss this and Van agrees that Supergirl's concerns for her cousin are well founded and that he has never seen Superman so...cranky. On the way back to Metropolis Superman thinks about the fact that he was kind of a jerk. He returns just in time to see Master Jailer going after Lana Lang and takes the villain out with relative ease. Afterwards Lana throws herself at Superman but once again Superman has to let her down easy. Superman and Lois fight about this as the Man of Steel repairs the damage caused by the Master Jailer. The tiff ends when Superman flies off. Morgan Edge comes into the room wondering where Clark Kent and Steve Lombard are. Apparently SKULL is attacking the Superman Museum. Superman arrives in record time and squares off against a new Atomic Skull. The new Skull's identity remains a secret thanks to his lead lined mask. The Atomic Skull attacks but while Superman feels the effects of the new villain's powers they seem to pass right through the other agents of SKULL. Superman follows them back to the WGBS building where, via x-ray vision and super hearing, he sees Lois defending Lana and leaving to spend the night at the hospital with her. Superman thinks about the fact that Lois is a wonderful woman as the SKULL agents disappear. Superman heads inside the building to change back to Clark Kent and appear on the nightly news. Meanwhile we find out that Mr. Mxyzptlk has been causing all of the weirdness going on with the Man of Steel. Apparently he has gotten himself in deep trouble with Grbnsqz the Wagerer and is in the midst of a double or nothing bet to keep from having to work for the Wagerer for the rest of his life. Mxy explains his plan to prove that Superman can be just as emotional as anyone and eventually his being that emotional will destroy him and everyone around him. Apparently Grbnsqz took destroy literally and now to win the bet Superman has to kill himself, which isn't what Mxy had wanted at all. Back at WGBS Clark asks about the footage from the SKULL agent's attack on the Superman Museum but learns that it never happened. After a brief distraction from Steve Lombard and his sloppy eating habits Clark goes back to figuring out what the heck is going on. Later Superman meets with Supergirl at the Fortress of Solitude. Supergirl shows him the footage of his battle with the SKULL agent and reveals Mxy's presence. Suddenly Metallo crashes through the wall and takes down both Superman and Supergirl. They wake up later and once again Superman is the only one left with the memory of the attack. Superman heads back to Metropolis and after a supposed battle with Bizarro figures out that the attacks always come after he became angry. Finally, with Lois' help, he is able to overcome the effects of Mxy's "spell" and Mxy is dragged off by Grbnsqz. Superman decides to let Supergirl stand in his place at the Crystal Hill Game Preserve dedication and takes the weekend off with Lois at the Fortress of Solitude. Story - 4: Despite the fact that I grew up with the Post-Crisis on Infinite Earths version of Superman I am a fan of his Bronze Age adventures. I haven't read all of them and some could get a little silly but there is an energy there that is hard to deny. One of the better writers of Superman in that era was Martin Pasko, so it is nice to see him work with the character again. Pasko has always had a solid take on the Man of Steel, most of which come from his own childhood experiences so I was excited to read what he had in store for us with this story. On the whole I liked this tale quite a bit. It was a lot of fun actually and I liked seeing a grumpy Superman. I can actually relate to Superman's plight in this story because I've been burning the candle at both ends myself lately. It was amusing to have this story come along when I was going through something similar. Sure I'm not out saving the world but at the same time if I don't get enough sleep I get really grumpy too. It was nice seeing the seventies versions of Superman's rogues gallery even if most of them were illusions. I always liked the Master Jailer, particularly his obsession with Lana Lang. The seventies Metallo was always cool and the more I see the old school Atomic Skull the more I like him. It was also neat to see the dynamic between Superman, Lois and Lana again. This was a pretty big sub-plot for a while there with Superman eventually telling Lana that Lois is the only woman for him. Actually that climactic scene came off more amusing than I think was intended because when it happens Superman is kind of a jerk. I like that Pasko brought that back and used it to further illustrate how cranky Superman was getting. It was also neat that in the end it was Lois and Superman's love for one another that ultimately won the day. It was also fun to see Mister Mxyzptlk, especially in this light. Mxy is usually an arrogant cuss and here is trying to save his own skin from someone that he ostensibly owes money to. I liked that a lot. I even felt a little bad for Mxy even though he is the antagonist but in the end he brought everything on himself so it is hard to have too much pity for him. I can't really think of anything negative to say about this story. I have a feeling it is going to be difficult to criticize these Retro issues too much because the main idea behind the line is nostalgia. The writers are trying to tell good stories but they are also trying to recapture an earlier era for the characters. On both of these fronts Pasko succeeded and gave us an enjoyable but more importantly fun story to read. Art - 4: If you would have shown me this artwork without letting me see the credits and told me this was Eduardo Barreto I wouldn't have believed you. It looks so different from his past work. I am curious how much of that has to do with him working with Christian Duce. It really doesn't matter because the art was strong throughout the story. 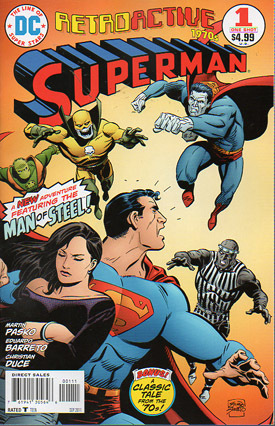 Some of the villains looked a bit wonky but the pages were dynamic and the artists conveyed not only Superman's confusion but his irritation as well. I also liked their takes on Lois and Lana though Lana showed a little more skin than she would have in the seventies. On the world known as Earth-2 Superman fights the Mechanical Marauders, which were built by Colonel Future. When Superman destroys them Future declares that he is going to find a way to destroy the Man of Steel. At the Daily Star Lois tries once again to prove that Clark Kent is Superman but fails. Elsewhere Col. Future has the villain known as the Wizard brought before him. He offers the Glastonbury Wand as payment to permanently remove Superman from the face of the Earth. The Wizard accepts and plans to test the wand while accomplishing his goal. Later Lois and Clark are walking down the street discussing Col. Future's gang when two members of the gang attack. Clark changes to Superman and fights the two members of Future's gang but disappears in the middle of the battle thanks to a magical incantation cast by the Wizard. The Wizard casts another spell that makes Superman disappear from the face of the Earth. Later the ground where Superman was banished opens up and Clark Kent walks off towards Metropolis. Clark doesn't remember he's Superman and in the days and weeks that follows he becomes a two fisted crusading reporter taking down gambling dens and the like while also dating Lois Lane. In between all of that he tries to find out what happened to Superman but no one seems to know what happened to the Man of Steel. Eventually Lois and Clark get married and on their honeymoon Future's men try to kill Clark. He survives leading Lois to get suspicious and that night she tries to cut his hair and the scissors break. She realizes that she's married to Superman but Superman doesn't remember that he's Superman. After the honeymoon Lois does some digging and tracks down the Wizard, who is now a bum sleeping on a park bench. Apparently he was not able to gain any notoriety for eliminating Superman and lost all of his confidence. Lois convinces him to bring the Man of Steel back and he does so if only to regain some measure of confidence. Superman returns and Lois assumes that their marriage is over. The Man of Steel disagrees and even takes her to his hidden fortress so they can exchange their vows again in a Kryptonian marriage ceremony. Story - 5: I love this story. I cannot adequately describe how excited I was that "Superman Takes a Wife" was included as the reprint in the 1970's RETROACTIVE special. For one thing I am a huge fan of the Earth-2 incarnation of Superman. I like the idea of Earth-2 in general because when it was still a going concern Earth-2 was the place where anything could happen. Batman got married, had a kid and died. Oddly enough he did two out of three of those in the past five years but back in the seventies DC would have never done such a thing. It is the same thing with Superman. DC would have never married the Lois and Superman of Earth-1 before the Crisis on Infinite Earths but writers could explore that on Earth-2. And they did. In fact this story led to a series in SUPERMAN FAMILY called "Mr. and Mrs. Superman" which were light little tales of the two helping each other out of jams. It may sound silly but I love those stories and that love comes from this issue. The great thing about "Superman Takes a Wife" is that the set-up for Clark and Lois getting married is very plausible. The Wizard makes Clark forget he's Superman. It's not what he set out to do but that's what happened. In Superman's absence Clark becomes a crusading reporter and wins over Lois Lane to the point that she marries him. In writing all of that it occurs to me that the main reason I like this scenario is that the Superman creators of the late eighties and nineties used a similar set-up to get their versions of Lois and Clark hitched. That's kind of weird when you think about it. It brings up an interesting question; do I like this story because it reflects the version of Superman I prefer or is it just a really good story? The answer is yes to both of those options. It does mirror what I liked about "my" era of Superman but Cary Bates tells an action filled story that, like the lead feature of this special, is a lot of fun. I will admit that this is an odd choice because DC is about to undo the marriage but at the same time I am glad that Superman readers and fans may get a chance to read this story for the first time. Art - 4: I have a lot of respect for Curt Swan. I don't like everything about his work and I have been very critical of him in the past but it is hard to deny his impact on Superman. This story was a good example of what I liked and didn't like about his work. Superman looked fantastic and I liked Swan's take on the Earth-2 S symbol. On the other hand Colonel Future and his men looked goofy and that was distracting to me. I found more things to like about the art than dislike, though and that was the important thing. There were even some creepy moments, like the pupil-less Wizard on the park bench. Overall I really dug the art and it is one of the reasons I love this story so much. Cover Art - 4: This is a great cover. I like the old fashioned, pre "DC Bullet" logo and the fact that a bunch of bad guys were coming to menace Superman while Lois looks annoyed in the foreground. Like the interior art this is not the Eduardo Barreto I am used to but I dug it just the same.